Ugu South Coast Tourism (Pty) Ltd is a multi-jurisdictional agency. The Ugu District Municipality established Ugu South Coast Tourism (Pty) Ltd as a Municipal Entity as contemplated by Section 86B of the Local Government Municipal Systems Act 32 of 2000. Ugu South Coast Tourism (Pty) Ltd covers the municipality areas of Ezinqoleni, Hibiscus Coast, Umdoni, Umuziwabantu, Umzumbe and Vulamehlo which are established within the geographical area of the Ugu District Municipality. In terms of Section 84 of the Local Government: Municipal Structures Act and Chapter 8A and specifically Section 86 of the Local Government: Municipal Systems Act, only Ugu Municipality is authorized in the district to deal with and develop Tourism in terms of its Service Level Agreement with South Coast Tourism (Pty) Ltd. The aims and objectives of the Ugu South Coast Tourism (Pty) Ltd are to promote tourism growth and development of tourism in the Ugu District Municipality area. UGUSCT aims to develop new tourism initiatives in the hinterland, improve existing tourist attractions and market the region as a premier tourist destination. 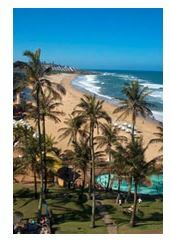 Ugu South Coast Tourism (Pty) Ltd is run, managed and administered at both Strategic and Operational Levels. The company is 100% owned by the Ugu District Municipality. Strategic Direction is provided by the Board of Directors appointed the Ugu District Municipality. The Board members are a combination of public and private sector professionals. Municipal Managers from all six local municipalities and a Senior Official from the Ugu District Municipality are members of the Board of Directors. The CEO (Chief Executive Officer) is responsible for implementing strategic issues whilst at the same time, manages the operations of the company. The CEO can be contacted at 039 682-7944 or on his personal email at ceo@tourismsouthcoast.co.za alternativelyadmin@tourismsouthcoast.co.za. Justin Mackrory CEO Ugu South Coast Tourism - How Green Are Our Valleys?